Rising young American Francis Tiafoe, the 2013 Orange Bowl champion, played his first tune-up event on grass at the Wimbledon junior tune-up in Roehampton. LONDON – For 16-year-old Francis Tiafoe, every day in tennis turns into a new experience. Here in England the past two weeks, the College Park, Md., native and promising junior is taking what could be considered an immersion course in playing tennis on grass. Until two weeks ago, the seventh-seeded Tiafoe had never stepped foot on a grass court. And his first introduction to the surface was at Roehampton, the Wimbledon junior tune-up tournament, where the grass is a far cry from the lush lawns of the All England Club. Tiafoe would make it to the Roehampton second round, but didn’t really gain an appreciation for the surface. While still unsure about his comfort on grass, he’s at least happy to discover the courts at Wimbledon are a privilege to play on. One especially valuable lesson that Tiafoe has learned at Wmbledon is the need for patience. Here in England, matches don’t always start and finish within what many people would consider a timely fashion. Tiafoe’s opening-round junior match at the All England Club was scheduled for Saturday; it finally concluded on Tuesday after rain washed out Saturday, Sunday is a traditional day off and more rain came on Monday, suspending the match in the middle of the first set. In the end, Tiafoe held off Martin Blasko of Slovakia, 6-4, 3-6, 6-3. A measured individual, Tiafoe comes across as far more mature than his years. Undoubtedly, he discovered early on how to grow through adversity. His parents, Francis Sr. and Alphina, emigrated to the United States from Sierra Leone in the 1990s, seeking a better life. After impressing with his work helping to build the Junior Tennis Champions Center in College Park, Md., Francis Sr. was offered a job there as a maintenance worker. As a result, Francis Jr. and his twin brother, Franklin, would often spend time there. Francis Jr. was immediately taken with the game and was allowed to play on the courts and take some lessons. The talent as well as his determination to succeed quickly became evident and the youngster was on his way to a potential career in tennis. Tiafoe has made steady progress ever since. Then, last December, a then-15-year-old Tiafoe became the youngest-ever Orange Bowl champion in a pool of previous winners that includes Roger Federer, John McEnroe and Bjorn Borg. In March, he reached the USTA International Spring Championships final. In April, he won the Easter Bowl title. By May, he was the top seed at the French Open. Tiafoe lost early at Roland Garros but was able to turn the French Open setback into a positive when Rafael Nadal, who would win his ninth French Open title later in the week, pegged the American as a practice partner. “About 45 minutes into our first hit I was getting tired and thinking this was pretty crazy,” said Tiafoe. “I was there for an hour-and-a-half and it was about as high an intensity as possible. [It] was pretty neat to see. 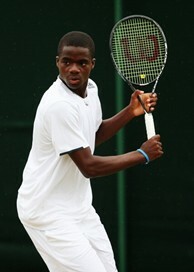 Tiafoe will face Yunseong Chung of Korea in the second round – another match to be won, another lesson to be learned.